Almo Nature Classic 70g Beef Adult Cat food is a food for cats that consists of pure beef or veal and other natural ingredients. Almo Nature Classic 70g Beef Adult Cat food is a cat food that consists of pure beef or veal and other natural ingredients. 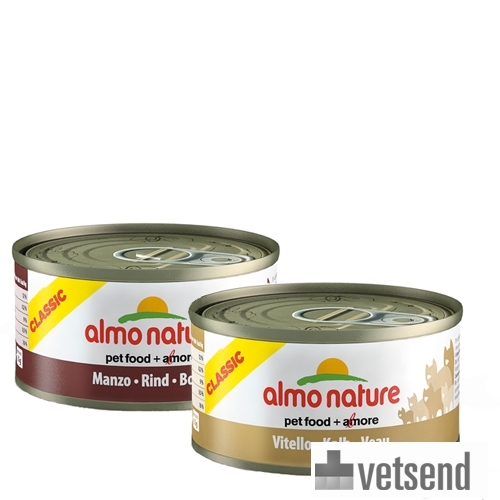 Almo Nature Cat food Classic 70g Beef is a canned food for adult cats. This tasty and traditional food consists only of natural ingredients and contains no less than 75% meat. The cows and calves are free range, and free from any additional hormones or chemicals during breeding. Because the meat is cooked without chemical treatment and is then preserved in its own cooking juices, the meat retains its flavours and is rich in natural vitamins and minerals. The food contains a small amount of rice. Almo Nature does not add any chemical preservatives and colourings to make the food appear more attractive. Because of its simplicity and authenticity this food has become a true classic that is well suited to any cat's taste. For a 100% nutritional balance, Almo Nature recommends a combination of 60% wet food and 40% dry food for cats. Classic Beef comes in the flavours Beef and Veal, and is available in 24 cans of 70 grams. Have you used Almo Nature - Classic 70g Beef - Cat Food before? Let us know what you think about this product.